Brayan Brito had always been fascinated with invention. As a child in Guatemala he would make his own toys with things around his house. When he got older he learned about Nikola Tesla and became intent on creating his own Tesla coil, so he took apart his brother’s computer to come up with the right materials. “I couldn’t get all the materials I needed so I couldn’t do it, but I wanted to — even if I had to destroy the computer,” he laughs. Brayan was granted asylum and moved in with some family members. Though he was safer in Virginia his depression persisted. Strife within his family forced him to move in with strangers, sharing space with people he didn’t know. He got a job at a restaurant to support himself, but it required him to work 12 hour shifts. Brayan went to high school in the morning and then went straight to work where he would stay until after 3 am. Another important thing changed once Brayan found Second Story — he had his own space to use as a lab. 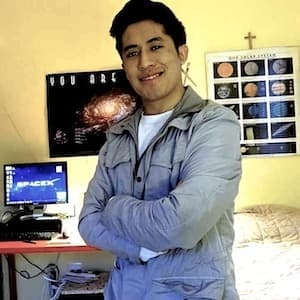 He remembered his first passion, the Tesla coil, and with his own space Brayan was able to create his own Tesla coil and other inventions. Now he’s dreaming of college. He would love to go to MIT and study robotics or computer programming. This year he received the Harry F Byrd Junior Leadership Award, a $10,000 scholarship for leadership in the community. The group chose three people from each congressional district and narrowed it down to one person from each. Brayan is one of eleven winners, and he accepted his award on Valentine’s Day at the Richmond Supreme Court. He wants to change the world with clean energy, keep doing what he does best and sell his ideas. But he wasn’t able to do it alone. “Everything that I was able to do was because of the support of a lot of people in my community.” His dreams gave him hope, too. Brayan set his eyes on Elon Musk and his work, completely inspired by his inventions and commitment to making the world a better place. “He has been an inspiration for me to dream big, even when the odds are against you,” Brayan says. Brayan’s past tells a story of achievement, prioritizing mental wellness, and pursuing your dreams. But the stories of his future are surely most exciting. Perhaps he will be our next Tesla or Elon Musk, the one next generation’s youth look to for inspiration and invention. One thing is certain: the community that came around Brayan when he needed help the most is now better off because of him.